The traditional Tich dien (ploughing) festival was held in Doi Son commune of Duy Tien district, the northern province of Ha Nam, on February 11 to pray for bumper harvests and prosperity for all. 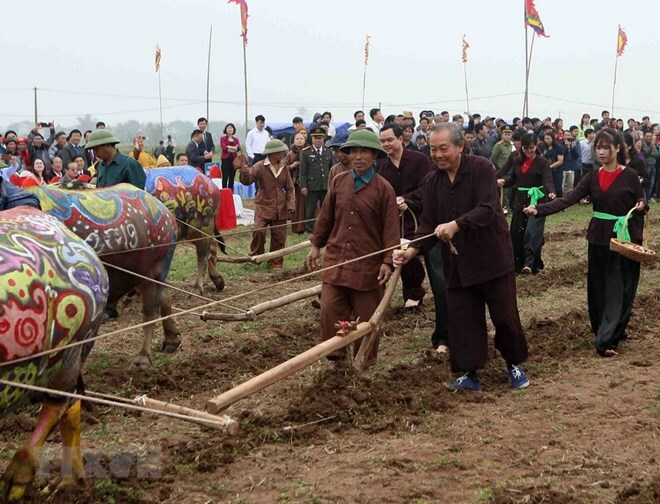 Deputy Prime Minister Truong Hoa Binh took part in the ploughing ritual at the event. According to historical records, the first Tich dien ceremony of Vietnam was organised at the foot of Doi Mountain by King Le Dai Hanh in the spring of 987. This ceremony has become a tradition practiced in every spring since then. The festival features the procession of the memorial tablet of King Le Dai Hanh from Long Doi Son Pagoda to the foot of Doi Mountain, where it merges with the processions of the local tutelary god and the founder of the Doi Tam drum making craft. The joint procession then moves to the paddy area believed to be the venue of the first Tich dien ceremony so as to carry out rituals praying to the Agricultural God for bumper harvests and prosperity. Addressing the event, Deputy Prime Minister Binh said the annual Tich dien festival in Ha Nam province – part of the national intangible cultural heritage – has become a highlight of the local culture. He spoke highly of the restoration and organisation of this festival, noting that this is a practical move to help preserve and uphold cultural values, encourage agricultural and rural development, and popularise Vietnam’s image. He noted with satisfaction that Vietnamese agriculture has made great strides when its growth rate surpassed 3.7 percent in 2018 – a seven-year record high, and the country has not only ensured its food security but also become one of the 15 leading agricultural exporters in the world. Meanwhile, rural areas have gained a facelift with over 42 percent of the total communes and 61 district-level localities recognised as new-style rural areas. At the Tich dien festival, a number of cultural and sports activities were also held, including drum performances, buffalo decoration, traditional wrestling and tug of war.